This week iy”h a new CD wil be released. The next in the series of Lchaim Tish, “Lchaim Tish Pesach”. This phenomenal CD includes songs from a variety of Pesach melodies from throughout the world, throughout the years. Lchaim Tish Pesach includes songs of simcha, songs from the seder, song specially for children, and even songs from the peyutim at the end of the Hagaddah, including Sefiras Haomer. All styles and atmosphere, are authentically Pesach and a Lchaim Tish production. Featured on the album are some amazing talents including; Moshe Shtekel, Yanki Daskal, Arale Samet, Levi Yitzhak Falkowitz. They are joined by yeled hapella Yehoshua Aryeh Mandel with exceptional performance and beautiful and the lchaim tish childrens choir. This album is a must have in every home to create a yom tov atmosphere. 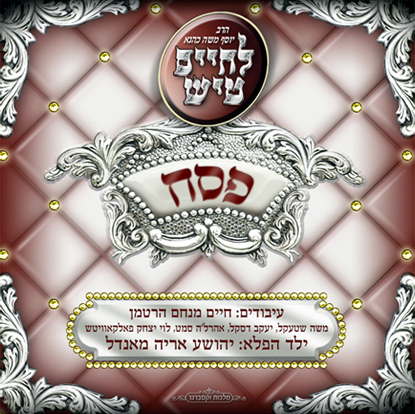 So whether you are cleaning in Nisan or getting ready for the seder on ever yom tov this album is sure to put everyone in the mood for Pesach.